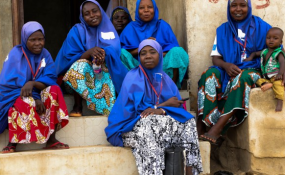 Nigeria: One Year After Polio Set Back, Is Nigeria On the March Again? The use of Volunteer Community Mobilisers has proved overtime to be an effective tool in many healthcare interventions across Nigeria. Almost a year ago, the global public health community was thrown into anxiety with the detection of four new cases of wild polio virus (WPV) in rapid succession in Borno State, Northeast Nigeria. Given the security situation, there was significant anxiety and many hoped that the country could avoid another resurgence of polio. Nigeria was almost there. But, when your goal is "eradication", almost is, sadly, not good enough. The Expert Review Committee (ERC) on Polio Eradication and Routine Immunization in Nigeria recently held its 34th meeting in Abuja to examine the progress made in the fight to eradicate polio and proffer advice for the future. The two-day session had groups of professionals who reviewed Nigeria's progress against polio and offered recommendations needed to achieve a polio-free Nigeria. In 2016, the ERC confirmed four cases of WPV in three local governments of Borno. These cases were genetically linked to the polio viruses that were circulating in Borno in 2011, revealing that there were undetected cases which since 2011 were being transmitted within the state. This led to an intensive response by the agencies of the Federal Ministry of Health, the Sokoto State Government and their partners. The response included seven rounds of supplementary immunisation campaigns, enhanced surveillance and increased mobilisation of all stakeholders. Nigeria has now gone one year without a case of the Wild Polio Virus. The setback of last year seems to have quelled the usual exuberant celebration, and there seems to be the realisation that Nigeria is dealing with a formidable foe which requires constant vigilance and a diligent response. At the meeting, the ERC acknowledged the efforts and commitment of the government and partners in responding to the polio outbreak in Borno. The government of Nigeria had immediately released N9.8 billion to support the response. Over 70,000 personnel were re-trained on surveillance across the country. The Executive Director of the National Primary Health Care Development Agency, Dr Faisal Shuaib said during the opening, "Some of the new initiatives used include systematic engagement of the military and CJTF, placement of transit vaccination teams at strategic locations, targeted vaccination at IDPs and Directly observed OPV (DOPV) administration. The response included high-level coordination with countries of the Lake Chad Region and the resultant synchronisation of campaigns." Insecurity is still a major challenge in Borno State, leading to inaccessibility, and this remains a significant risk to global eradication efforts. Dr. Pascal Mkanda, the Polio Eradication Programme Coordinator at WHO Africa Regional Office, noted at the ERC meeting that "162,616 under-5 children are still unreached in Borno, although the number of inaccessible settlements reduced from 50% in July 2016 to 33% in July 2017." The ERC recommended that support from the Nigerian security forces be maintained, with increased intensity of regular coordination and advocacy meetings with the military. According to experts at the meeting the situation in Borno is the highest risk for the program in Nigeria. To avoid future surprises, the Nigerian government must ensure intensification of immunisation in access-compromised areas. Also highlighted at the meeting was the plight of "high-risk" populations such as IDPs and Nomads, and the need to proffer specific and sensitive approached. While polio was the reason for the meeting and the focus of global attention, there are people with more challenging problems in their day-to-day lives. Of particular concern were malnourished children among IDPs. It was noted that malnourished children may have different immunological response to vaccination, therefore a response focused exclusively on vaccination will not work. This is yet another reason to immediately address malnutrition, the humanitarian and health emergency, in the North East. The last meeting of the Presidential Task Force on Polio Eradication held in April 2017. Before then, the group had not held any meeting in the last two years. This appears to demonstrate waning political commitment and accountability. It was also noted at the ERC meeting that there has been sub-optimal and late release of counter-part funding by most high-risk states and LGAs. Most importantly, the ERC noted that the Government is yet to fulfil its 2017 financial contribution due to delay with the 2017 budget. Some partners also delayed the release of their 2017 financial contribution. Being so close to the end, this may provide a false sense of comfort that is over, putting the program at risk. Fighting back tears, Prof. Oyewale Tomori, Chairman of the ERC, said at the meeting, "My country is still Polio endemic. When I think about this, I am moved to tears". Tomori has spent most of his career fighting viruses that cause outbreaks in Nigeria, especially polio. Sitting on many global committees, he said he was looking forward to putting to bed the indignity of Nigeria having the last case of WPV in the world. In the past few years Nigeria's polio status has fluctuated several times; In July 2014 - Endemic; September 2015 - Non-endemic; July 2016 - Endemic; September 2017 - No WPV in last 13 months. We are not sure what to report in 2018, but one thing is for sure, we cannot be complacent. While a strong response has been recorded, we as a country must not relent in our efforts towards receiving a polio-free certification in 2019. We must ensure that commitment is not just at the national level but at local government and individual level - because everyone is involved in the fight to eradicate polio, not for two years, but forever. Once this is done, we must learn from and leverage on the resources dedicated to polio immunisation to build up our routine immunisation system and strengthen surveillance to help build a much stronger public health architecture for Nigeria. Copyright © 2017 Nigeria Health Watch. All rights reserved. Distributed by AllAfrica Global Media (allAfrica.com). To contact the copyright holder directly for corrections — or for permission to republish or make other authorized use of this material, click here. Is Nigeria the World's Most Difficult Place to End Polio?